← ViVid Translations releases its first doujin! It’s the heartfelt moment we’ve all been waiting for, brought to you in doujin form. 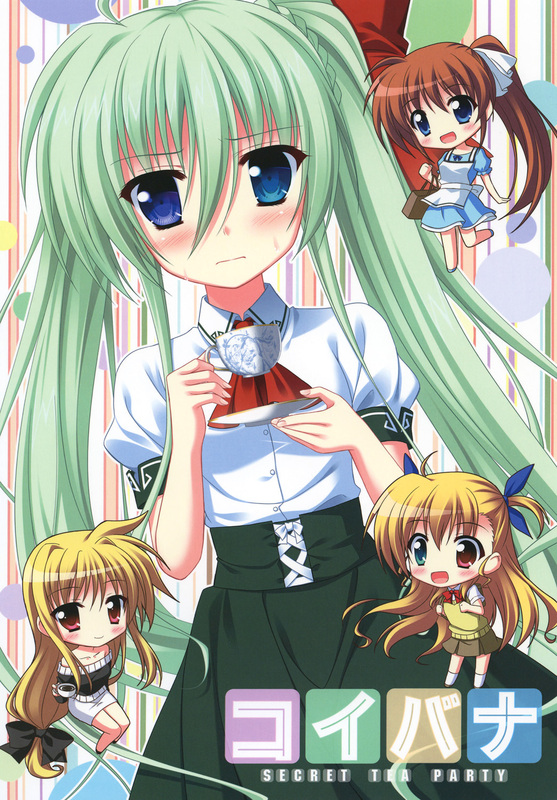 Einhart and Fate share secrets about love and life over coffee in Love Story Secret Tea Party. 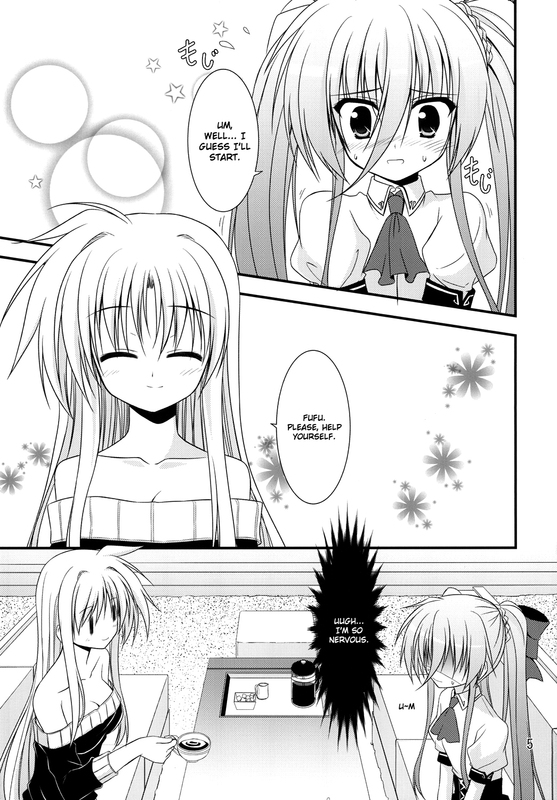 This entry was posted in Doujin, Releases, ViVid era and tagged doujin, einhart, fate, mahou shoujo lyrical nanoha vivid, Nanoha, ViVid, ViVid Translations, Vivio. Bookmark the permalink. Liking Vivid it would be nice if more Einhart/Vivio oriented works have been translated, NanoFate group is mostly concentrated on NanoFate theme. 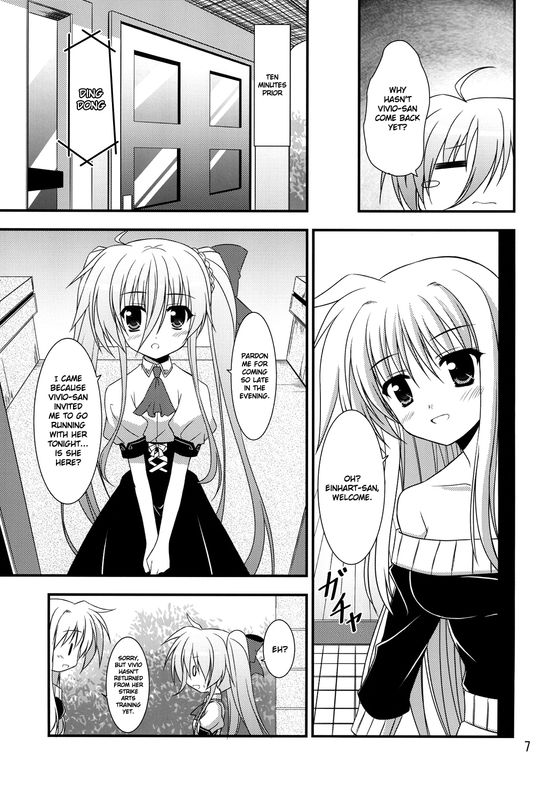 There are actually really nice Einhart/Vivio doujins on their site in doujin section which just needs to be translated, maybe you guys could pick up some. Thanks again! Looks like you are having fun translating these jolly doujin. Though I feel a bit sorry for Erio if Fate, the closest thing he has for a mom, has such a low opinion of men. I’m still surprised no one else finds it odd that the doujin is named “Secret ‘Tea’ Party” while the girls are actually drinking coffee. I did note it, but I thought it must be a direct translation from Japanese, Japan being such an ancient tea drinking country, it’s vocabulary possibly encouraging such a term, however inaccurate. Kind of like “a coffee break” is an ordinary term even if not all drink coffee. I figured that would be the case. And yeah “coffee break” is a great analogy on an old American ritual that used to be completely centered around coffee and where now coffee is optional. Awww that was so sweet~ But what EXACTLY was being censored those 2 times? A certain hand gesture that involves the thumb. Yeah, “Secret Tea Party” is actually in English on the cover, despite Fate going out of her way to drink coffee over tea due to the rest of her family’s preferences in the actual story. I honestly think the subtitle was supposed to be a reference to Alice in Wonderland more than anything else. Don’t know if it has a name. Just make a fist with your thumb sticking out from between your middle and index finger. Apparently it’s called the “fig sign” (I had to look this up, as I wasn’t aware it had a name either). Most articles I can find on it mention its sexual connotation, and the fact that its considered offensive in some countries, Japan included. However, the basic meaning when shown in this context is an implication that the subjects being discussed have a sexual relationship. Unless my memory is particularly failing me, anyone who watched Naruto back when it first aired will remember Konohamaru making this gesture when he first sees Naruto and Sakura together, with similar implications.